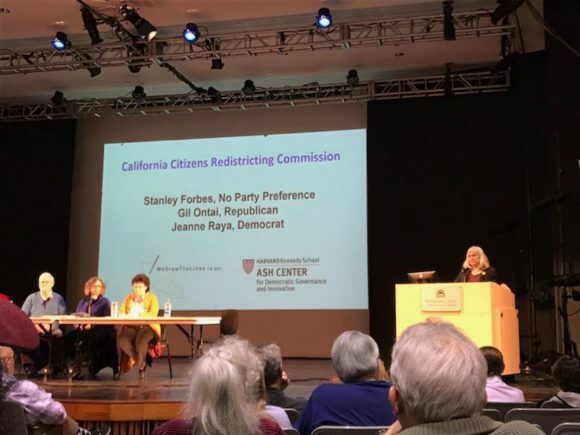 Members of the California citizens redistricting commission spent three very full days in Pennsylvania from March 26th to 28th meeting with legislators, speaking with the press and presenting in four town hall meetings in State College, Harrisburg, Blue Bell and Philadelphia. Gil Ontai, a Republican and an architect from San Diego, affirmed that change is possible, despite the “learned hopelessness” that comes from gerrymandered maps and an overly partisan process. He encouraged listeners to put down partisan divisions and help make an electoral system that ensures every voice is heard. Jeanne Raya, a Democratic and an attorney from San Gabriel, Los Angeles County, shared the experience of convening open meetings where average citizens and powerful legislators (including U.S. Representative Maxine Waters) were given the exact same opportunity for comment. Stan Forbes, an almond farmer and private bookstore owner from Esparto, Yolo County, who is registered as “decline to state,” explained that a responsive process ensured more competitive elections and renewed confidence in the electoral system and state legislature. The three were enthusiastic about the recent positive changes in California, shaped in large part by a shift to much fairer districts. In the ten years of legislative and congressional elections before redistricting reform, only five seats changed parties, earning California a ranking of least competitive in the nation. In the three elections following reform (2012-16), 56 new legislators have been elected, nine in congressional districts, nine in the state senate and 38 in the state house. In 2014, Ballotpedia ranked California first in competitiveness for state legislative races. Some of these changes may be attributed in part to a shift to a top -two primary system, but the commissioners note with pride that California cities, impressed with renewed civic engagement and more competitive elections, have begun to adopt their own citizens redistricting commissions. They also called attention to the fact that all challenges to the new maps have been unanimously denied by the state Supreme Court, which has repeatedly affirmed that the lines were drawn by means of a transparent, impartial process. Every part of the redistricting process was made public, from interviews with commission candidates to real-time broadcast of mapping meetings. Check the California Redistricting Commissions We Draw the Lines website to learn more. Did the commissioners have any regrets about the way they handled the redistricting process? Only that they did not have enough time or funding to visit the more remote parts of the state. What are the takeaways for PA? Some details of the redistricting process (like the number of public meetings to be held across the state) shouldn’t be set in stone in the state constitution, but specified in implementing legislation or regulations. The overall message was very clear — a citizens redistricting commission works, restores trust in the electoral system and is definitely worth the fight.